United Airlines made a mistake and it cost me $1,550! Marcus DeGruttola says United Airlines’ mistake didn’t just cost him $1,550. It also left him and his wife, Holly, stuck in Africa. He needs some help unraveling a very complicated case and getting a refund. DeGruttola was flying from Boston to Johannesburg on four different airlines; he used United Airlines frequent flyer miles to book the flights. Along the way, two airlines canceled his flights for various reasons. He had to pay an extra $1,550 to set things straight. Of course, the three airlines are now pointing the finger at each other, and they want DeGruttola to pay for their mistake. I don’t know if there’s any lesson to be learned from this case, other than maybe to keep your flight itineraries simple and to never pay for your ticket with miles, which seem to be a second-rate currency. But if I said that, I would probably get run out of town with torches and pitchforks by airline apologists. So let’s just pretend I never said it and get on with the story. Whoa, my head is spinning! But it gets even more complicated. When we arrived in Johannesburg Airport on Sept. 16 to fly to Cairo, we were told by EgyptAir that our tickets for both MS840 on that day and for MS787 had been canceled. We had just arrived from Botswana earlier that day (on a separate airline ticket) and were stuck in the Johannesburg Airport international transfer desk area with no options so we ended up repurchasing our tickets for both MS840 and MS787 for 23,007.00 ZA Rand ($1,550 plus a $46.50 foreign transaction fee). Despite having repurchased our tickets for MS787, we ran into the problem again when we arrived at Cairo airport on Sep 24 when we were told our tickets had again been canceled. Though in this case, EgyptAir was willing to uncancel our tickets so we could get home. Wow, that’s five airlines and flights booked with funny money. What could possibly go wrong? So, the question is, how do we get a refund of the $1,550 and the $46 foreign transaction fee he had to pay for the new tickets? After several months of working with United to try to resolve the matter, we were told by United that we would need to seek our refund directly from EgyptAir. On contacting EgyptAir, they told us that we needed to seek our refund from United. So we are not sure what to do at this point. We suspect that our EgyptAir tickets were canceled because of an additional flight that was included on the EgyptAir itinerary on Sept. 5, 2018, on MS839. 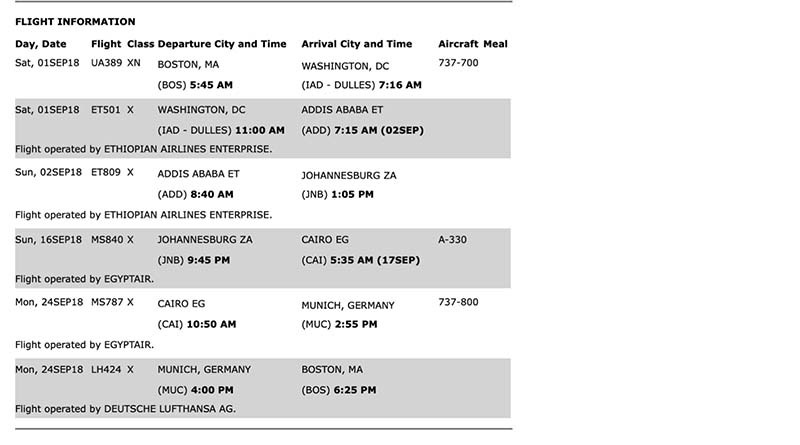 The Sept. 5th flight was never part of or shown on our United itinerary. My wife and I were actually aware of and concerned about this extra flight on Sept. 5, so we contacted United before we started our trip to make sure this “ghost leg” would not be a problem. We were told by United that it should not be a problem. When I challenged with “are you sure,” the agent checked with her supervisor and confirmed that it should not be a problem. Wait, what’s a ghost leg? I’ve heard the term used only in the context of a hidden-city itinerary. If you want to go down a rabbit hole on ticketing ethics, check out this story on the legalities of travel hacking. DeGruttola just wants his money back. Here’s how I see it. United Airlines is happy to take DeGruttola’s money and to give him miles, points, or bottle caps. It will allow him to book a Frankenstein itinerary to Africa. But when it comes to standing behind that itinerary, it will defer to every partner airline rather than take responsibility. I think that’s wrong. Our advocate Dwayne Coward recommended that DeGruttola contact executives at both United Airlines and EgyptAir. He did, with mixed results. United called and left a message saying it would help with EgyptAir. But EgyptAir then said it had no record of his second ticket purchase in its system. “I think they are suggesting I need to communicate with the EgyptAir South African office directly,” he told Dwayne. After Dwayne contacted United, the airline had a change of heart and agreed to a partial refund of the miles (110,000 miles out of the 225,000 miles used for the tickets) plus $1,200 in travel vouchers. Perhaps. But this case was madness from start to finish. It shouldn’t matter which partner airline you’re flying. The airline that took your money should also take care of you. United left DeGruttola high and dry. Should he have been messing around with a “ghost leg”? Probably not. But that’s no way to treat a loyal customer. Did United Airlines do enough for DeGruttola? Yes, considering the ticket shenanigans, absolutely. No, he deserved a full refund. Posted in Commentary Tagged WHO CAN FIX THIS UNITED AIRLINES' MISTAKE?, WHY SHOULD A UNITED AIRLINES' MISTAKE COST ME MONEY?